1.New Age Metals (NAM) flagship project is the River Valley Project, which is the largest undeveloped primary PGM resource in North America, with 4.6 Moz PdEq in Measured Plus Indicated including an additional 2.6 Moz PdEq in Inferred. The River Valley PGM Project is located in Ontario and has an excellent infrastructure and is within 100 kilometers of the Sudbury Metallurgical Complex. The project is 100% owned by New Age Metals (see news releases dated March 21st, 2018 and April 11th, 2018). 2.Ground IP geophysics final report completed by Abitibi Geophysics. NAM's Management is working with Alan King, NAM's Sudbury Geophysical consultant, to review all geophysics and complete a separate more comprehensive report and recommendations. 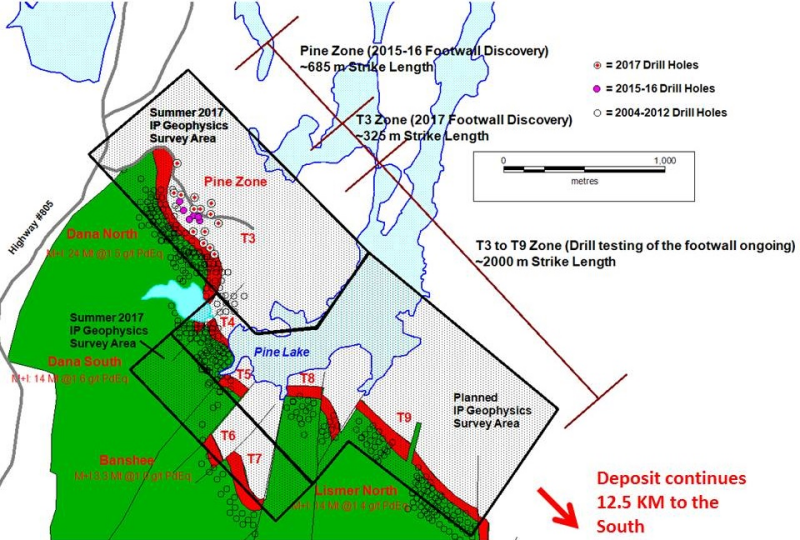 3.The goal of the geophysical survey was to test various new footwall targets on the main River Valley PGM Deposit, southward of the 2016/2017 new discovery, the Pine Zone (See News Release: Jun 19th, 2017) to cover the area between target anomalies T4 through to T9 (Figure 1) which is in the northern portion of the 16km project. 4.Field crews have mobilized to begin surface exploration on the project, more specifically to complete further detailed testing of the new geophysical anomalies from the Abitibi report and to collect further samples that will be used for additional ongoing metallurgical and mineralogical testing, all of which will add to the information needed to complete a Preliminary Economic Assessment (PEA). 5. 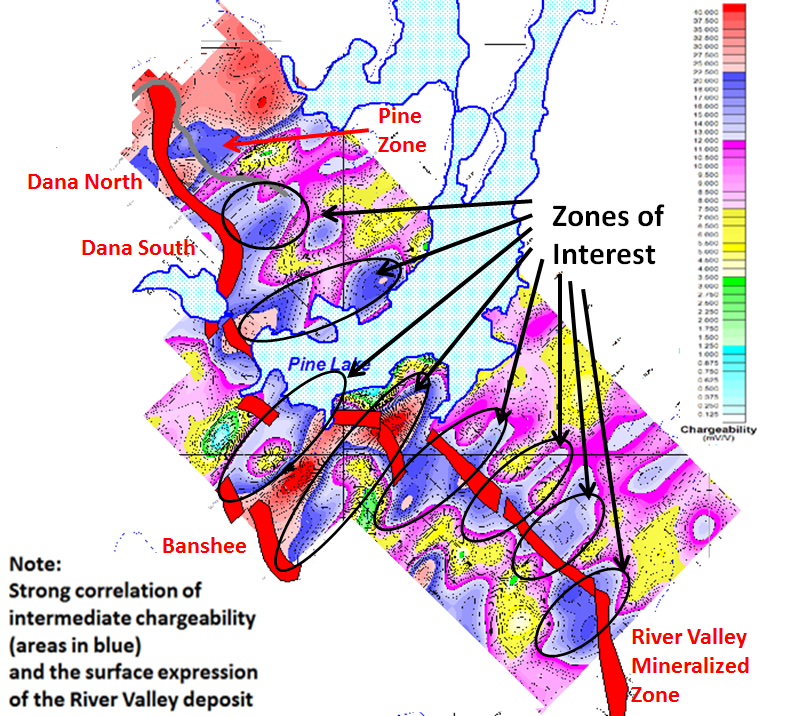 The footwall PGM mineralization is new and the Pine Zone discovery has proven that it is both adjoining and adjacent to the existing mineralization and is an additional source of PGMs at the River Valley project. Several new large anomalies have been identified in the northern portion of the project and will be ground proofed in the summer and fall of 2018. 6.NAM's management is working on finalizing its selection of an experienced PGM engineering company who will help NAM's technical team to complete this projects first Economic study, a Preliminary Economic Assessment (PEA), on NAM's 100% owned River Valley PGM Project. June 13th, 2018 / TheNewswire / Rockport, Ontario, Canada - New Age Metals Inc. (TSX.V: NAM; OTCQB: PAWEF; FSE: P7J.F) is pleased to announce that the Abitibi geophysical report for the River Valley Project is complete. All past and present geophysical reports are being reviewed by Alan King, the company's Sudbury based Geophysical Consultant, and Mr. King's objective is to work with NAM's technical team to recommend a two phase drill program for the Northern portion of the River Valley Project based on several large new anomalies which appear to be adjacent to our existing mineralization. The anomalies will be examined in 2018 in the field and if warranted, added to the two phase drill programs. Alan King's report will include specific recommendations for drilling in the northern portion of the River Valley Project. The ground geophysical survey performed was a high-resolution OreVision(R) IP survey performed by Abitibi Geophysics (Thunder Bay, Ontario). OreVision IP can reveal targets at four times the depth of conventional IP without compromising near-surface resolution. The goal of the geophysical survey was to test the footwall portion to the main River Valley PGM Deposit, southward of the Pine Zone IP survey (News Release: Jun 19th, 2017, and May 8th,2018) and to cover the area between target anomalies T4 to T9 (Figure 1). This area represents a survey strike length of approximately 2000 metres. An initial review of the chargeability plan map from the Abitibi report (Figure 2) shows a good correlation with the River Valley PGM Deposit at surface and the recent footwall discoveries in the Pine Zone. The mineralization zone (red unit on Figure 2, RV Mineralized Breccia Zone) has a well-defined geophysical signature (blue) on the chargeability map (Figure 2). This will be a strong exploration tool in going forward in planning new drill targets into the main zone and into the footwall. The main mineralization corresponds well and correlates with the chargeability feature. This feature extends the length of the survey and as mentioned, corresponds with the location of the surface mineralization. Figure 2 is the chargeability at the 125 meter level above sea level. A further review notes that the Pine Zone (footwall mineralization) extends perpendicular to near perpendicular from the chargeability feature. Elsewhere along the extent of the chargeability feature are other perpendicular to near perpendicular features similar to the area of the Pine Zone Figure 2 - Zones of Interest). These anomalies will be further examined in the field as they may indicate other areas of footwall mineralization as seen at the Pine Zone. Field crews will focus on the target areas above in Figure 2 to generate additional drill targets which appear to be adjacent to the existing mineralization identified in the May 8th 2018 NI-43-101 report. The summer/fall exploration plan has begun for the company's Lithium Division. NAM has 100% ownership of eight pegmatite hosted Lithium Projects in the Winnipeg River Pegmatite Field, located in SE Manitoba, with focus on Lithium bearing pegmatites. Three of the projects are drill ready. This Pegmatite Field hosts the world class Tanco Pegmatite that has been mined for Tantalum, Cesium and Spodumene (one of the primary Lithium ore minerals) in varying capacities, since 1969. NAM's Lithium Projects are strategically situated in this prolific Pegmatite Field. Presently, NAM is the largest mineral claim holder for Lithium and Rare Metal projects in the Winnipeg River Pegmatite Field. Lithium Canada Development is a 100% owned subsidiary of New Age Metals (NAM) who presently has an agreement with Azincourt Energy Corporation (AAZ) whereby AAZ will now commit on its first year a minimum of $600,000 in 2018. In its initial earn in AAZ may earn up to 50%, of the eight Lithium projects that are 100% owned by NAM. AAZ's 50% exploration expenditure earn in is approximately $2.950 million and should they continue with their option they must issue up to 1.75 million shares of AAZ to NAM. NAM has a 2% royalty on each of eight Lithium Projects in this large pegmatite field. For additional information on the NAM/AAZ option/joint-venture and recent acquisitions (see the news releases dated Jan 15, 2018, May 2, 2018, May 10, 2018). NAM's flagship project is its 100% owned River Valley PGM Project (NAM Website - River Valley Project) in the Sudbury Mining District of Northern Ontario (100 km east of Sudbury, Ontario). Presently the River Valley Project is North America's largest undeveloped primary PGM deposit with Measured + Indicated resources of 160 million tones @ 0.44 g/t Palladium, 0.17 g/t Platinum, 0.03 g/t Gold, with a total metal grade of 0.64 g/t at a cut-off grade of 0.4 g/t equating to 3,297,173 ounces PGM plus Gold and 4,626,250 PdEq Ounces (Table 1). This equates to 4,626,250 PdEq ounces M+I and 2,713,933 PdEq ounces in inferred (see May 8th, 2018 press release). Having completed a 2018 NI-43-101 resource update the company is finalizing its 2018 exploration programs which will include geophysics, and extensive drill programs, which are all working towards the completion of a Preliminary Economic Assessment (PEA). Our objective is to develop a series of open pits (bulk mining) over the 16 kilometers of mineralization, concentrate on site, and ship the concentrates to the long-established Sudbury Metallurgical Complex. On May 23rd, 2018, NAM's board approved a Preliminary Economic Assessment (PEA) on River Valley Platinum Group Metals Project's. Management is currently finalizing its selection of a 3rd party engineering company to complete this PEA. This will be the first economic study on the project. Alaska: April 4th, 2018, NAM signed an agreement with one of Alaska's top geological consulting companies. The companies stated objective is to acquire additional PGM and Rare Metal projects in Alaska. On April 18th, 2018, NAM announced the right to purchase 100% of the Genesis PGM Project, NAM's first Alaskan PGM acquisition related to the April 4th agreement. The Genesis PGM Project is a road accessible, under explored, highly prospective, multi-prospect drill ready Pd-Pt-Ni-Cu property. 1.CIM definition standards were followed for the resource estimation. 2.The 2018 resource models used Ordinary Krig grade estimation within a three-dimensional block model with mineralized zones defined by wireframed solids. 3.A base cut-off grade of 0.4 % g/t PdEq was used for reporting resources. 4.Palladium Equivalent (PdEq) calculated using (US$): $1,000/oz Pd, $1,000/oz Pt, $1,350/oz Au, $1750/oz Rh, $3.20/lb Cu, $5.50/lb Ni, $36/lb Co.
5.Numbers may not add exactly due to rounding. 7.The quantity and grade of reported inferred resources in this estimation are uncertain in nature and there has been insufficient exploration to define these inferred resources as an indicated or measured mineral resource and it is uncertain if further exploration will result in upgrading them to an indicated or measured mineral resource category.